Your content gets shared. But is that enough to build authority or increase traffic? For every piece of content, BuzzSumo owner Steve Rayson says you need an amplification strategy. He believes content should attract both shares and links. 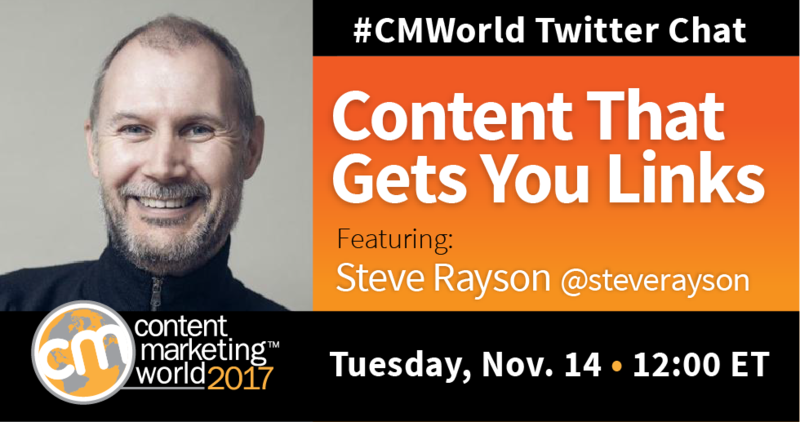 To discuss this topic more, we invited Rayson to a recent #CMWorld Twitter chat. Here we’ll share some highlights from the chat. You can read a full summary of tweets in our Storify recap. You may also want to take a look at Rayson’s post on the Content Marketing Institute blog. Why is it important for marketers to think about how and why their content will be amplified before they create it? What are some reasons why people share your content? Why would they link to it? What kind of content have you found to be effective in earning links? Let us know in the comments below. Looking to create stronger, engaging content? Learn how you can work smarter, not harder, at Content Marketing University. Winter enrollment is now open, GIFT100 saves you $100 of the registration costs. money makes the world go around, content makes the internet spin like a drum.